Spend five days immersed in studying outdoor survival skills! Wilderness skills not only provide valuable tools that can be life-saving in the outdoors, but also teach concepts needed in the event of a natural disaster. Survival skills enhance our relationship with the natural world and connect us with our ancestral roots. Class days are full of activities and instruction. 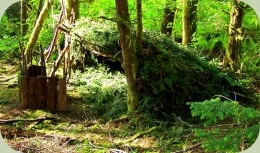 Students construct a variety of survival tools to take home and have the opportunity to spend a night in a survival shelter. Includes free camping at the Alderleaf campus. Special note: Parents can register their kids to attend the Wilderness Skills Camp for Youth which runs concurrently. "The Wilderness survival course gave me tools to use in a survival situation, but also provided a knowledge base to help me look at the world around me in a new, more resourceful way. Thank you very much!" "The instructors are knowledgeable and experienced. Their stories make the course much better than trying to learn from books or the internet." "Alderleaf's instructors are a wonderful resource. We're so fortunate to have them in our area. I was able to create the tools for making fire, purifying water, even making a survival shelter. I came here thinking I would see experts demonstrate advanced skills in wild crafting. I never thought I personally would experience the kind of success I did; making fire for the first time is awe inspiring. Thank you!" "A wide-ranging sampler of survival and primitive living skills. Exposed me to lots of ideas to practice on my own and explore. Nothing like instant feedback of real instructors over read a book." "This was a truly profound experience. I learned a ton about survival and myself in the process." "The survival intensive was a life changing experience. I will never see, hear, or move through the wilderness the same way again!"